Apr 16 TV Recap: American Gods: Season 2, Episode 6 "Donar the Great"
American Gods is nothing if not a roller coaster. As a viewer who remains burned by the frustrating aspects of this season — Salim and Jinn, the mostly weightless bloodshed, and all that pesky plot, plot, plot — I must begrudgingly admit my admiration for Donar the Great. While standing alongside The Greatest Story Ever Told as Season 2’s best example of a singular vision with interconnected characterization and theme, it confirms Gods as a show whose best material is often sandwiched with its worst. I’ve gained a newfound kinship with X-Files fans who vastly prefer the monster-of-the-week episodes to the overarching mythos, and MCU enthusiasts who’ll take the director-driven standalone entries over the team-ups. Like those properties, Gods excels when it’s just living in the moment — something I wish happened more often lately. This week’s episode was a tale of two sons — at least in the symbolic sense. An anecdote where Mr. Nancy speaks of blazing a destructive path between two worlds is key, since that’s exactly what’s happening with Wednesday’s past and present. We see flashbacks to a time when he was more often called Al Grimnir, singing and hosting burlesque shows at the Regius Theater. His star player is also his son, the hammer-wielding, perfectly chiseled and practically glowing Donar (Germanic for “thunder”— guess what his more popular name is). Back in the present-day plot, Wednesday is once again paired with Shadow at a mostly empty shopping mall, hoping that the dwarf Dvalin will etch runes of war and fix their invaluable spear. To get that pesky plot back into motion, they must retrieve… Lou Reed’s iconic leather jacket. I never thought a fetch quest would come to bail this show out, but I’m not complaining — there’s a refreshing sense of simple-minded fun that allows Wednesday and Shadow to breathe and banter. It’s been far too long. But don’t mistake this for a weightless endeavor. Shadow eventually asks Wednesday about his son — since in the Old God’s eyes, Shadow and Donar (you guessed it, Thor) aren’t too different. It’s obvious that Shadow shares neither Donar’s whiteness nor his privilege, but we learn in the flashbacks that the god of thunder’s identity (and even his physicality) was also used as a means to an end. Though Donar has discussed moving to California with lover and fellow star performer Columbia, he and his father are given another proposition from a sinister source — Nazis, rebranding themselves as the “Friends of New Germany.” They want to sponsor an American for the World Weightlifting Championship in Chicago, and Donar is just a shave and a haircut away from being their ideal choice. Any misgivings you might have about Wednesday using Shadow for selfish means of self-preservation are given a more chilling light here, since “Al” seems more than willing to sell his son (and soul) to fascism for the sake of bringing renewed relevance to the Old Gods. By the time Donar realizes the Nazis want him to lose a competition to Germany, the damage is done — Wednesday lies to Columbia about the thunder god’s intentions, ruining their chance to run away to California. It would seem Wednesday doesn’t hold his chosen ones’ love interests, or any interests outside his own, in very high regard. Therein lies what could become a major conflict of interest for this show. As Ricky Whittle and Ian McShane have become increasingly amusing and effortless in their onscreen chemistry, it’s becoming increasingly vital for Shadow to break away. I cannot deny that I enjoyed watching the two concoct a scheme to get that leather jacket — there’s no way to stay somber as a grinning McShane talks up a clueless clerk while posing as a rock & roll savvy bishop. It’s both funny and sad that Shadow poses as a U.S. Secret Service agent to “arrest” Wednesday and keep the jacket as “evidence” — he’s acting as a member of an institution that’s oppressed him, all in the real-life service of a mentor figure who’s using him. One would hope Shadow’s fate ends up brighter than Donar’s. It’s when he calls out Wednesday’s lies that we finally get to see why the thunder god is history (despite the public’s widespread knowledge of Thor, as Shadow points out). When father and son fight in an alleyway — Wednesday with his spear, Donar with his trusted hammer, which breaks the spear in two. It’s a tragic showcase of how the Old God’s selfishness has burned bridges between lovers while blazing dangerous new ones — in this case, setting the upcoming holy war in motion. While Wednesday has reached some very villainous depths by this point (as The Greatest Story Ever Told began hinting at, he and Mr. World might as well be two sides of the same bad coin), he’s complicated with a genuine capacity for grief. It appears that he might not have been responsible for his son’s death — rather, Donar is shown using a shotgun to kill himself sometime after their stand-off, with the resulting bloodshed spelling “Somewhere in America,” frankly the first “shocking” visual this season that’s felt genuinely earned. As it turns out, suicide is the only form of death that Gods can’t be resurrected from (though I can’t help but wonder how opportunistic their definition of “sacrifice” is). And in an increasingly rare pitiable moment for Wednesday, when asked if the Valkyries provided safe passage for Donar, he says he has no idea. In this episode, American Gods zeroed in on some of its best material in either season by cutting back on the number of conflicting subplots. A tragic past set the stage for an amusing crime caper in the present — but if the result of Wednesday’s spear being ready to heal is any indication, the future might be doomed to more bleakness. With runes etched and things happening “ahead of schedule,” Mr. World seems convinced that the stakes are escalating. The New Gods are anticipating a “new friend” of their own as New Media requests extra tech support ahead of their planned “launch.” It seems safe to say that there will be even more moving pieces in this picture by the time we hit S2’s finale, for better or worse. Shadow and Wednesday have had just enough intriguing, emotionally and morally discomforting moments this season to convince me there’s a smarter version of this show trying to get out. Once again, the signs were gratefully clear this episode, but my expectations remain guarded. I want to believe that this series can continue toward a more ambiguous, heady direction than its plot’s current conflict would suggest. And thankfully, Donar the Great’s virtues can stand on their own regardless of where this all ends up. I only hope that once the series is reclaimed by a steady show-runner, we’ll have more time to question what all this madness means. TV Recap: American Gods: Season 2, Episode 6 "Donar the Great"
American Gods surprises with “some of its best material” of the season so far. TV Recap: American Gods: Season 2, Episode 5 "The Ways of the Dead"
Another episode that prioritizes plot over character and theme disappoints following the best of the sophomore season. 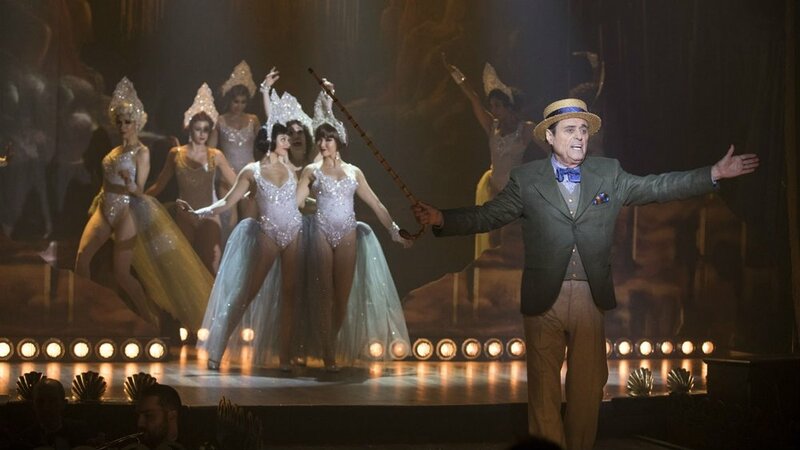 TV Recap: American Gods: Season 2, Episode 4 "The Greatest Story Ever Told"
Tyler calls Episode 4 the best, most affecting, and most promising episode so far this season. On the legacy of the show five years after its finale, both good and bad. TV Recap: American Gods: Season 2, Episode 3 "Muninn"
Some compelling new characters and exciting ideas bring back some of that S1 magic, but is it enough? TV Recap: American Gods: Season 2, Episode 2 "The Beguiling Man"
The series and its characters search for purpose in this equally promising and worrying episode. TV Recap: American Gods: Season 2, Episode 1 "The House on the Rock"
Does the supernatural drama manage to maintain its quality after the loss of its creators? Tyler is here to find out. It’s when this ambitious and visually stunning miniseries goes small that it impresses most. TV Recap: Kidding: Episode 1 "Go Means Go"
Carrey’s new series gets off to a rocky start. The eventful third episode of the season finds David exploring mazes of the mind. Apr 10 TV Recap: American Gods: Season 2, Episode 5 "The Ways of the Dead"